One of the key elements of LTE is the use of OFDM (Orthogonal Frequency Division Multiplex) as the signal bearer, as well as OFDM’s associated access schemes, OFDMA (Orthogonal Frequency Division Multiple Access) and SC-FDMA (Single Carrier Frequency Division Multiple Access). OFDM is used in a number of other of systems from WLAN and WiMAX to broadcast technologies including DVB and DAB. OFDM has many advantages including its robustness in the face of multipath fading and interference. Although it may appear to be a particularly complicated form of modulation, it is in fact well suited to digital signal processing techniques. In view of its advantages, the use of ODFM and the associated access technologies, OFDMA and SC-FDMA are natural choices for the new LTE cellular standard. OFDM is a form of transmission that uses a large number of closely spaced carriers that are modulated with low rate data. Normally these signals would be expected to interfere with each other, but by making the signals orthogonal to each another there is no mutual interference. This is achieved by having the carrier spacing equal to the reciprocal of the symbol period. This means that when the signals are demodulated they will have a whole number of cycles in the symbol period and their contribution will sum to zero - in other words there is no interference contribution. 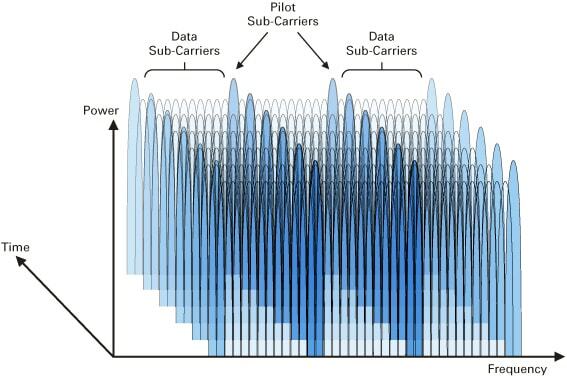 The data to be transmitted is split across all the carriers and this means that by using error correction techniques, if some of the carriers are lost due to multi-path effects, then the data can be reconstructed. Additionally, having data carried at a low rate across all the carriers means that the effects of reflections and inter-symbol interference can be overcome. It also means that single frequency networks, where all transmitters can transmit on the same channel, can be implemented.